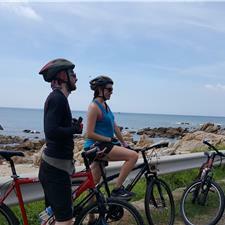 Cycling Along Ocean Road: Da Lat - Red Sand Dunes(Mui Ne Beach) - Black Gold City(Vung Tau Beach) - Ho Chi Minh City 3 days 2 nights. Black Gold City: During 14th and 15th centuries, the cape that would become Vung Tau was an area which European trading ships visited regularly. The ships' activities inspired the name Vung Tau, which means "ship's bay" or "anchorage" in Vietnamese. The city is located in the southern part of Vietnam, and is situated at the tip of a small peninsula. It has traditionally been a significant port, particularly during Vietnam's period of French rule. Today, the city's importance as a shipping port has diminished, but it still plays a significant role in Vietnam's offshore oil industry. Vung Tau is the only petroleum base of Vietnam where crude oil and gas exploitation activities dominate the city's economy and contribute principal income to Vietnam's budget and export volume.